Located in Paris, Hotel Cecilia is 350 metres from Place de l’Etoile and the famous Arc de Triomphe. Free Wi-Fi is available. 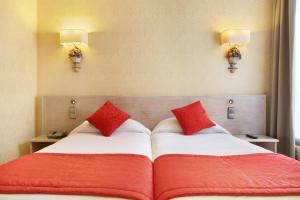 All air-conditioned Cecilia rooms have an en suite bathroom and flat screen TV with satellite channels. The hotel’s reception area extends into a vast lounge with a bar, reserved for guests, that is open 24 hours a day. Hotel Cecilia’s location makes it easy to discover Paris’ many wonders. Avenue des Champs-Élysées with its many shops is 350 metres away. The Charles de Gaulle-Etoile Metro (lines 1, 2 and 6) and RER (line A) station is located at Place de l’Etoile a 2-minute walk from the hotel. 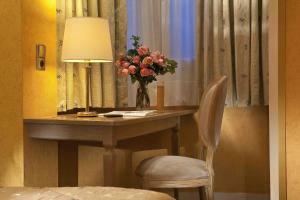 Rooms with a view of the Arc de Triomphe are available upon advanced request and carry an additional charge. Room service is available 7:00 to 20:00. Please note that if you require a children's cot, please contact the property directly in order to arrange this facility. 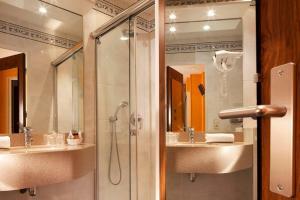 These air-conditioned rooms include a private bathroom with hairdryer and are equipped with cable and satellite TV. This room cannot accommodate an extra bed. Rate: € 133.75 ... € 168.33; select dates below to get current rates. Overlooking the courtyard, these air-conditioned rooms include a private bathroom with hairdryer and are equipped with cable and satellite TV. Rooms with views of Mac Mahon Avenue are available upon prior request and with a surcharge. Extra beds and baby cots cannot be accommodated in this room. 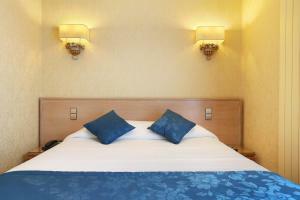 Rate: € 131.00 ... € 170.00; select dates below to get current rates. 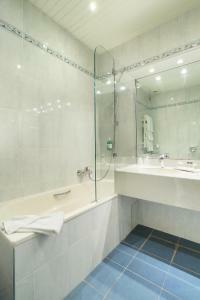 These rooms include a flat-screen TV with satellite channels, tea and coffee-making facilities and a private bathroom. This room can accommodate an extra bed at an extra cost. It is available on request and subject to availability. Rate: € 120.00 ... € 185.00; select dates below to get current rates. 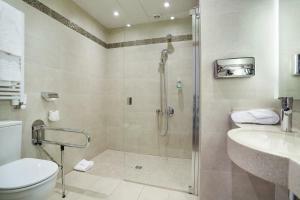 These en suite rooms include a flat-screen TV with satellite channels, tea and coffee making facilities. They overlook the courtyard. This room cannot accommodate an extra bed. 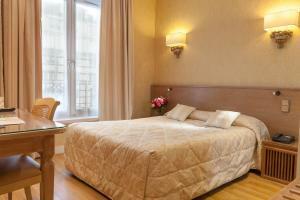 Located on the street side, this double room has air conditioning, electric kettle and satellite TV. Located on the street side, this twin room has air conditioning, satellite TV and electric kettle. This air-conditioned room features satellite TV, safety deposit box and wardrobe. The private bathroom includes a hairdryer and free toiletries.